High Falls, Rocks and Water: Dealing with the conditions at hand and having back-up equipment! 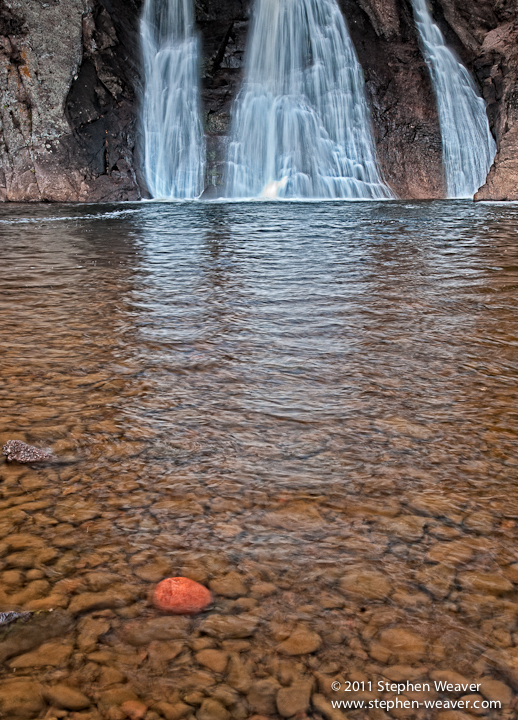 I made this image of High Falls in Tettegouche State Park on a trip to the North Shore Region of Minnesota. I had hoped to photograph some spectacular fall colors, but as it turned out I was late by about a week as a large wind storm had brought down most of the leaves. I traveled to Minnesota primarily to attend the annual meeting of the Geological Society of America that was held in Minneapolis this year, so I wanted to take advantage of the travel and do some photography after the meeting. The North Shore region along Lake Superior north of Duluth is spectacular, and I headed first to Gooseberry Fall State Park where I previously had photographed a Summer solstice sunrise over Lake Superior. As I prepared for a sunrise from the rocky shore and was setting up my tripod low in front a pool I had hoped to get a nice reflection of color in, a moment of in-attention resulted in a bit of a disaster! As I turned to get my cable release from my pack, my tripod with my Nikon D700 and 14-24 lens tipped over and crashed into the shallow pool. Not a good feeling as I quickly pulled it out, but the damage was done. The result was a large scratch in the middle of the front element of the lens and a wet camera body. Not good,and I thought well there goes the trip!. Fortunately I had my D300 along as a backup, but my only other wide angle I had with me with was a 24mm TS-E that has a 36mm field of view on the D300. With this combination I would not be able to photograph the real wide angle shots with prominent elements large in the foreground I love to compose. Oh well, sometimes photographers have to just deal with the situations and conditions they are presented with. So traveled a bit farther north to Tettegouche SP, and ended up a having a great couple of days concentrating on images and compositions that worked with the equipment I had and did not lament the real wide angle compositions I could not make. This image of High Falls (the highest waterfall in Minnesota) was made using the 24mm Tilt -Shift, which given the composition I extracted actually worked well. The moral of this story for all photographers is 1: pay attention to the stability of your tripod; 2, have a second camera body as a back-up; and 3 see and extract the compositions that can be made with the equipment you have!